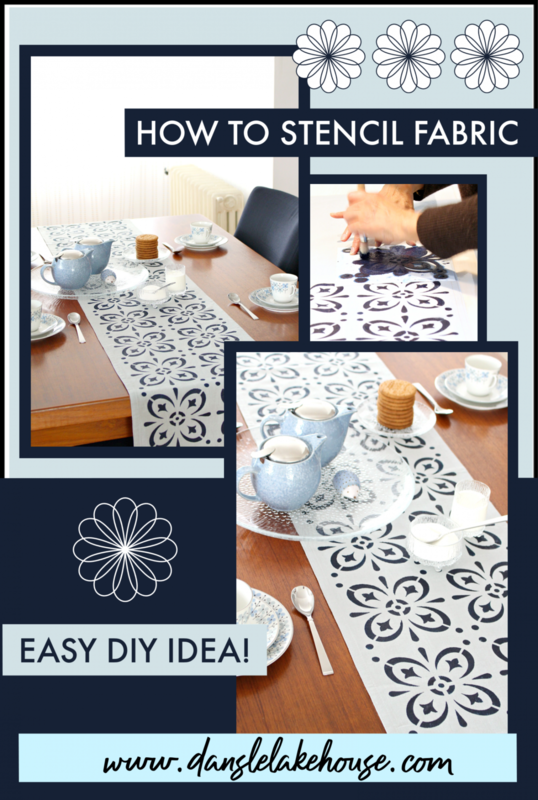 If you’ve ever searched for a certain fabric print or table linen to no avail, here’s a tutorial for you: learn how to make your own DIY stenciled fabric. 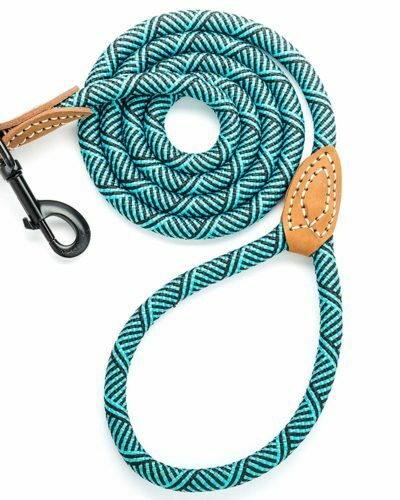 With a stencil of your choosing and acrylic paints which can be custom mixed to literally any color, you can create pretty much any design, in any colorway, to create the perfect fabric! 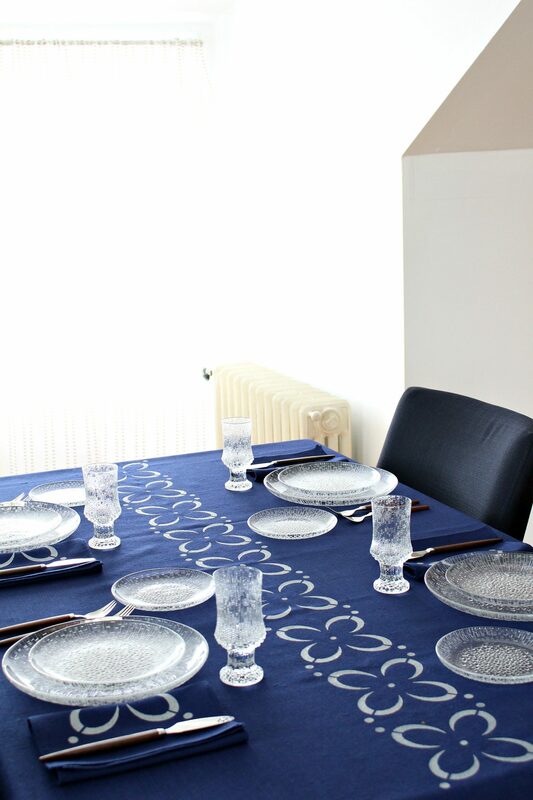 Today I’m sharing two DIY stenciled fabric projects: an easy stenciled table runner plus a stenciled table cloth with matching napkins. 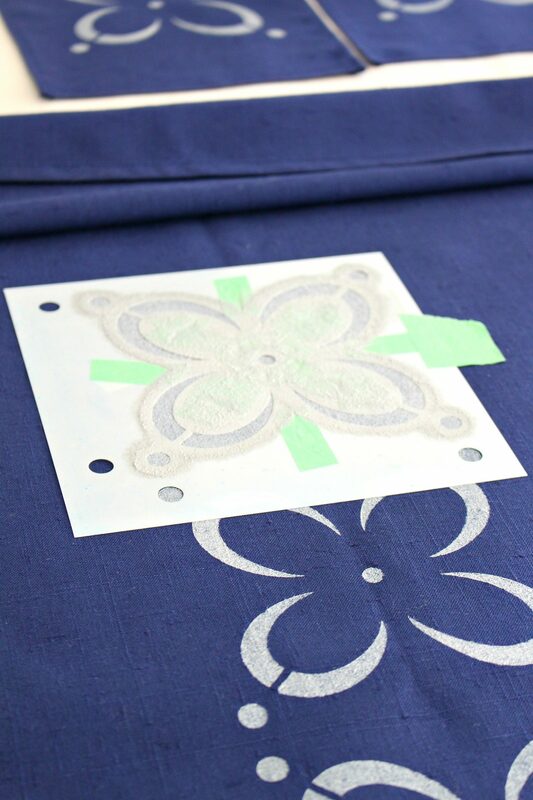 Here’s a sneak peek at both projects, then I’ll dive into the how-to, including some stenciling tips and which supplies will create the best DIY stenciled fabric. 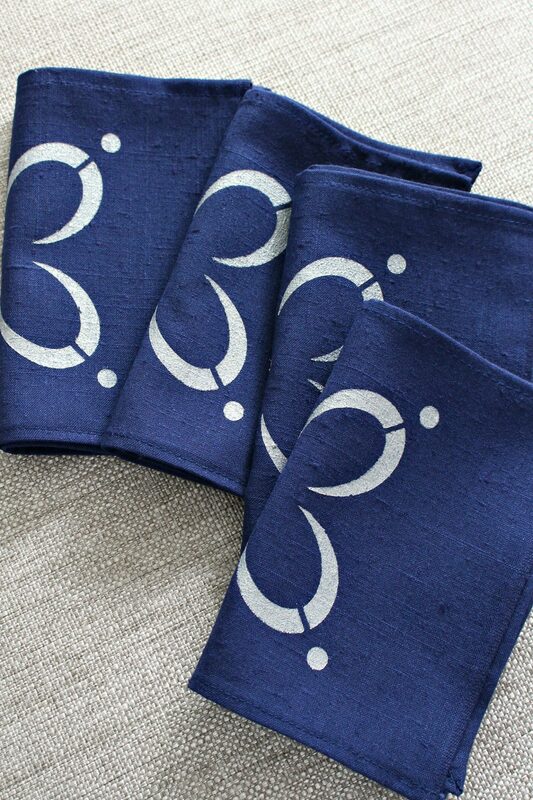 I collaborated with Stencil Revolution for these easy DIY stenciled fabric projects. 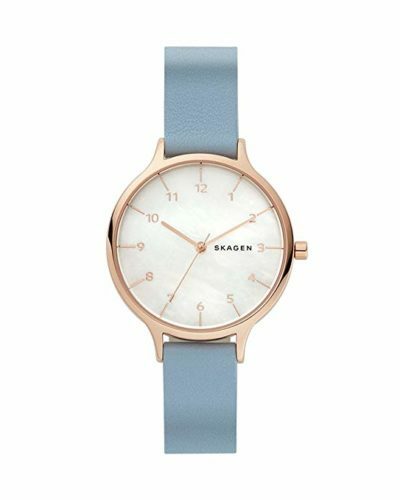 I immediately envisioned indigo on pale grey, or cream/silver on indigo fabric – so that was easy! 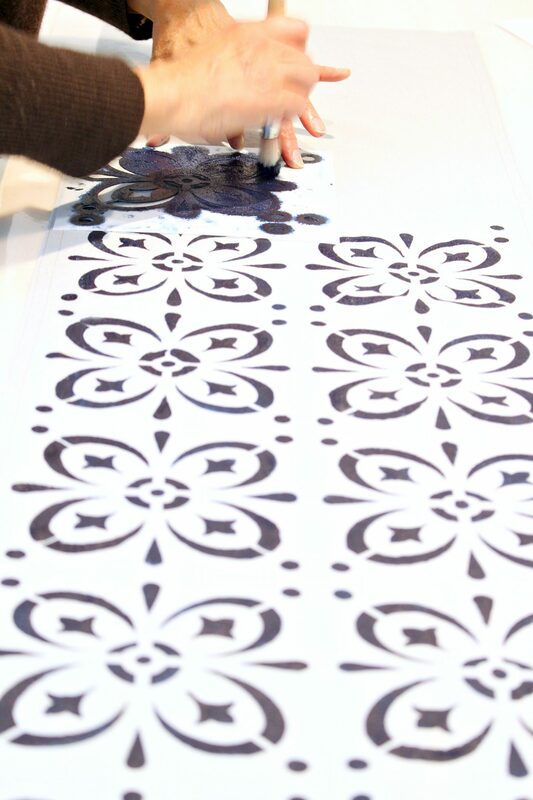 – but choosing a stencil was really difficult because Stencil Revolution makes so many gorgeous designs. Finally I narrowed it down to the tile stencils and ultimately chose the Starvos stencil (which can be used on painted floors or concrete to create a gorgeous tiled effect). 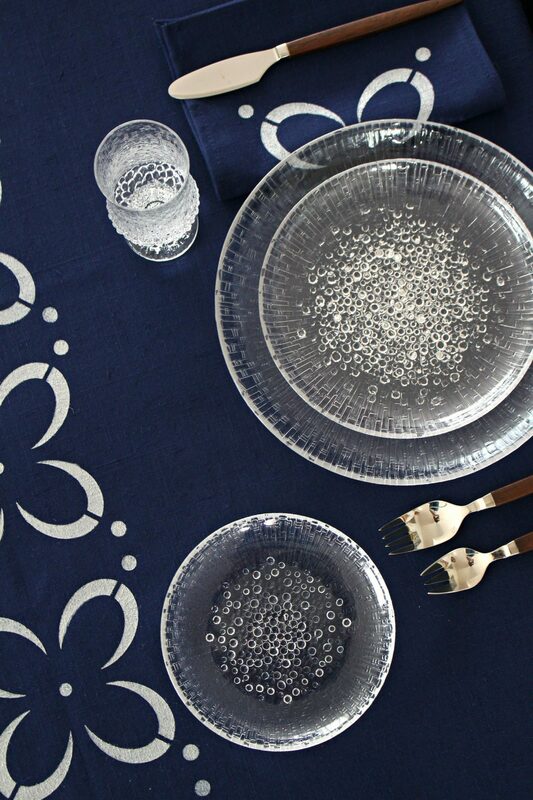 Click here to learn how to sew an oval table cloth and pop over to this tutorial to learn how to sew a mitered corner. 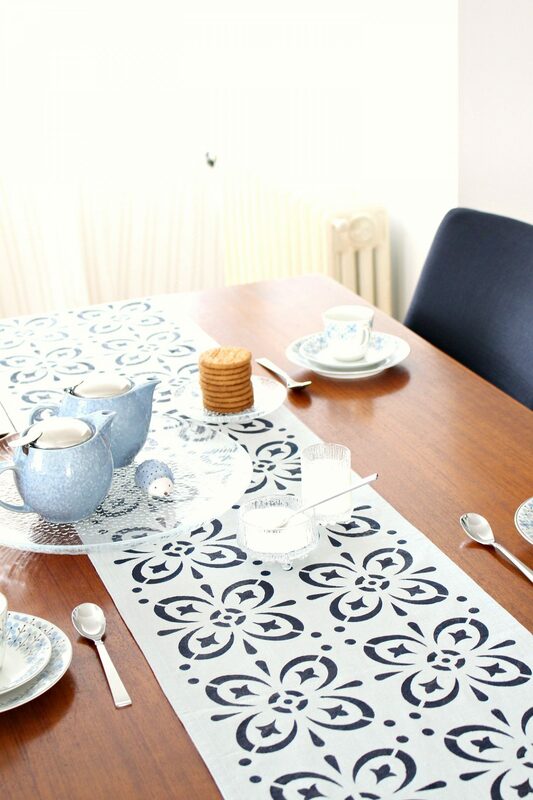 With those two sewing tutorials, you can easily sew your own table runner, tea towel or table cloth or you can purchase a plain, solid table linen and give it an easy upgrade. 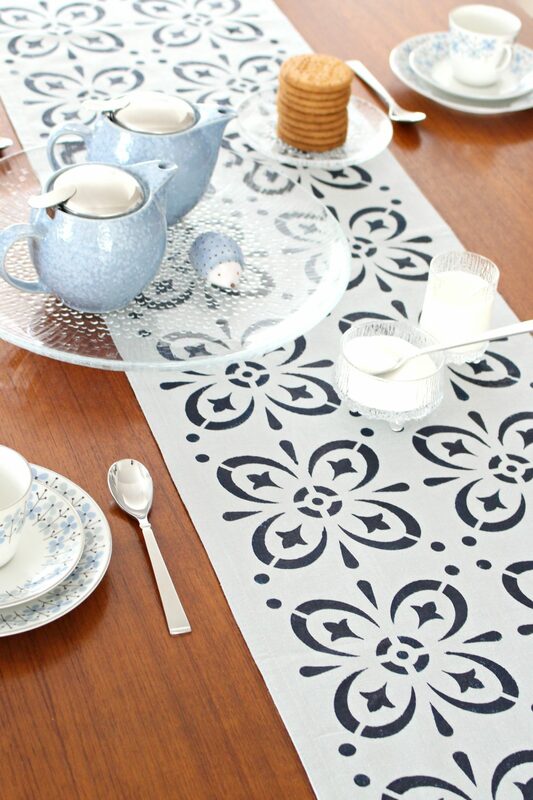 Be careful of bleed through with this DIY stenciled fabric project. You will want to protect your surface – the more thin/sheer the fabric, the more bleed through. We only got a little bleed through with the grey cotton runner, which is a very thin fabric, but the poly-blend table cloth was thicker with a tighter weave, so we didn’t get any bleed through with that at all. If the bleed through bothers you, choose a thick sturdy fabric. 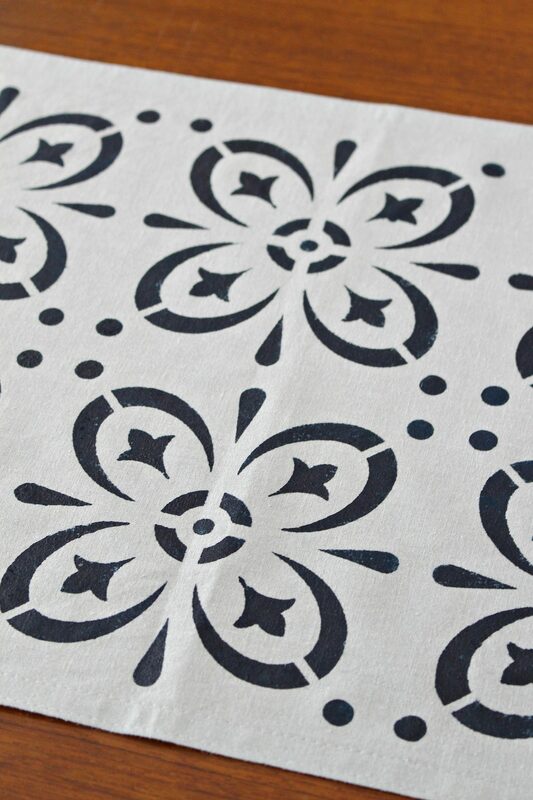 Before you begin, wash and iron your fabric to remove any sizing and also to create a smooth surface for stenciling. 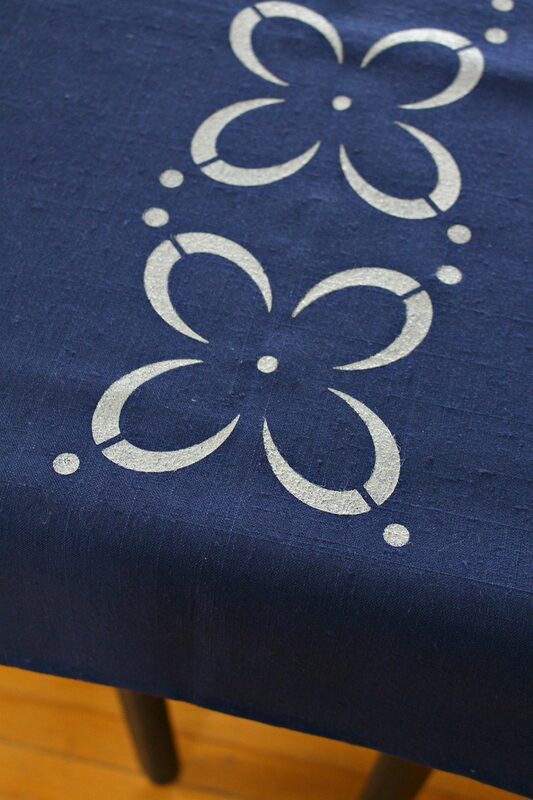 Then map out your design and placement and, if possible, experiment with stenciling on a scrap piece of fabric. 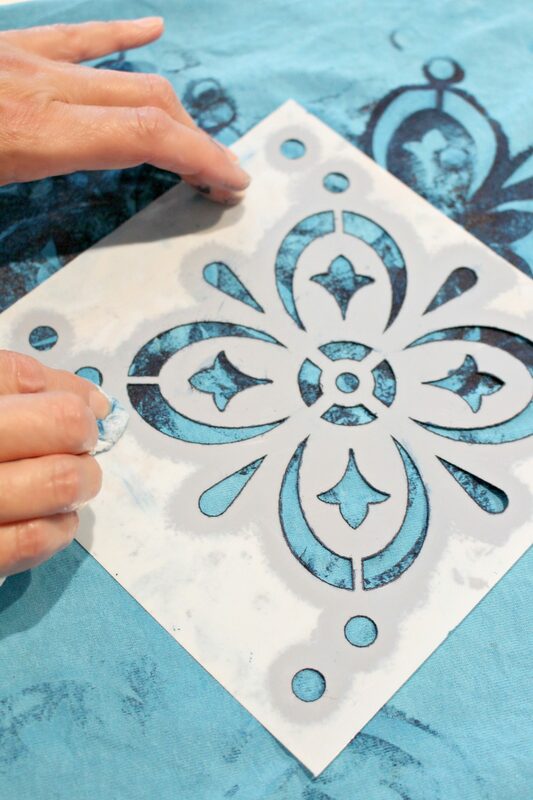 Unlike a floor or wall, where you can touch up a mistake by correcting with the base color paint, stenciling a fabric is a one shot deal – but don’t stress, because once you’ve tried a few stenciled trial runs, it becomes really easy. With the pattern mapped out, it’s time to start stenciling! 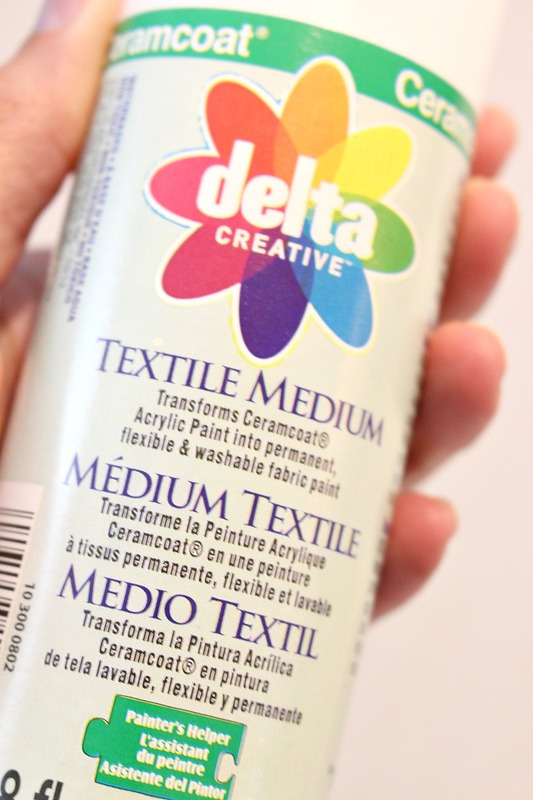 Mix up your acrylic paint with the textile medium, or pour some fabric paint onto a palette, and dip in your stenciling brush. 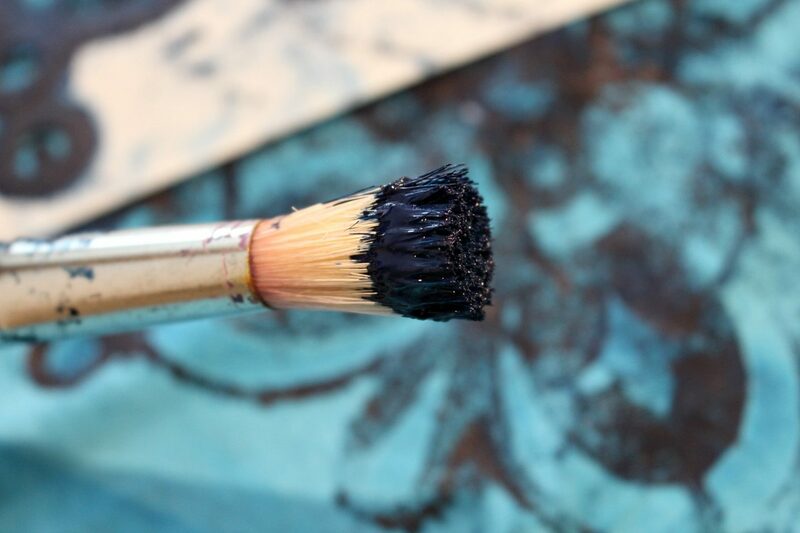 With this brush, you want to make a stippling motion, being careful not to drag the paint. Use a light touch with the amount of paint used, it’s easy to build up multiple thin layers as opposed to globbing on one thick layer, which can seep under the stencil. 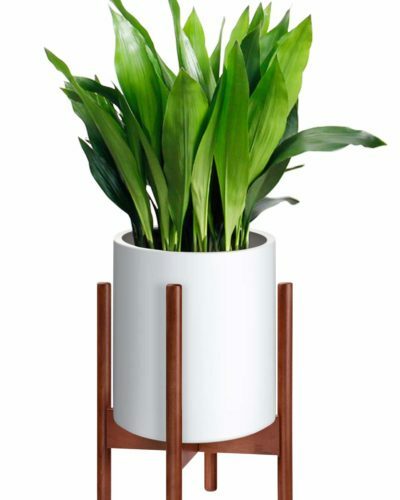 We opted to simply hold down the stencil, but you can also use a temporary spray adhesive or tape. 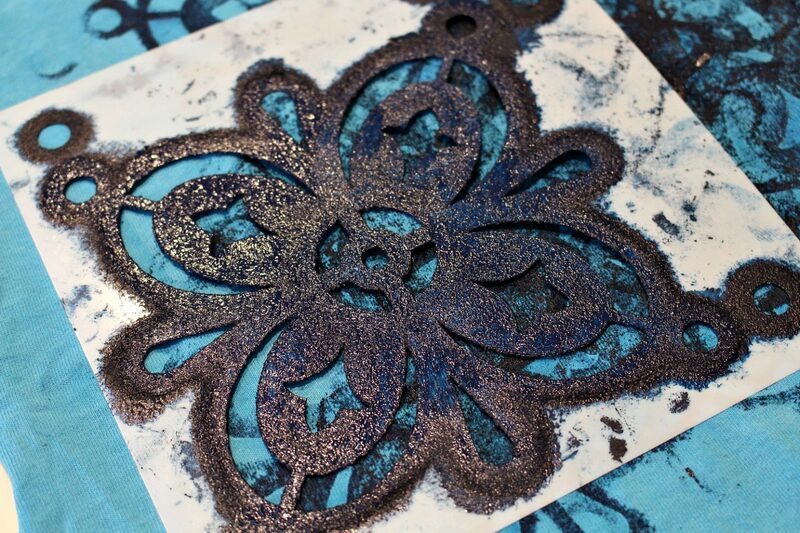 Working from the outside of the stencil inward, make a vertical stippling motion and lay on the paint, being careful not to budge the stencil. 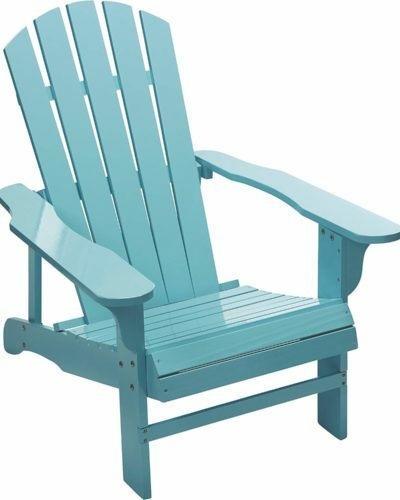 When the paint looks uniform, remove the stencil without dragging it (just lift up quickly) and lay it face down on an old rag. 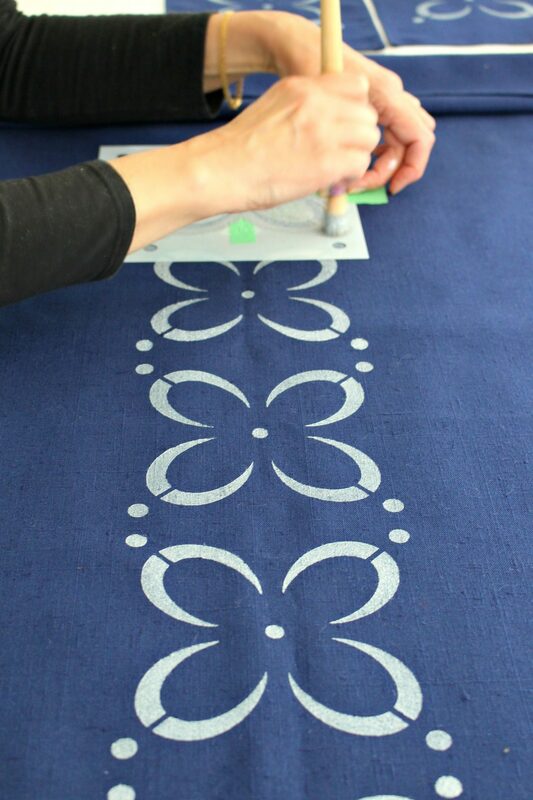 Using a clean, slightly damp rag, wipe the back of it to prevent any paint from smudging the next piece of the design. 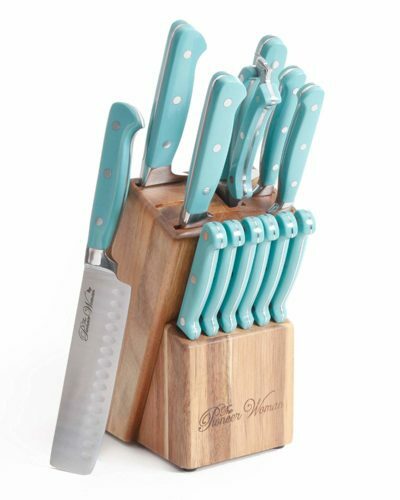 This extra step helps keep the design crisp without smearing. With the design completed, let the fabric dry overnight undisturbed. 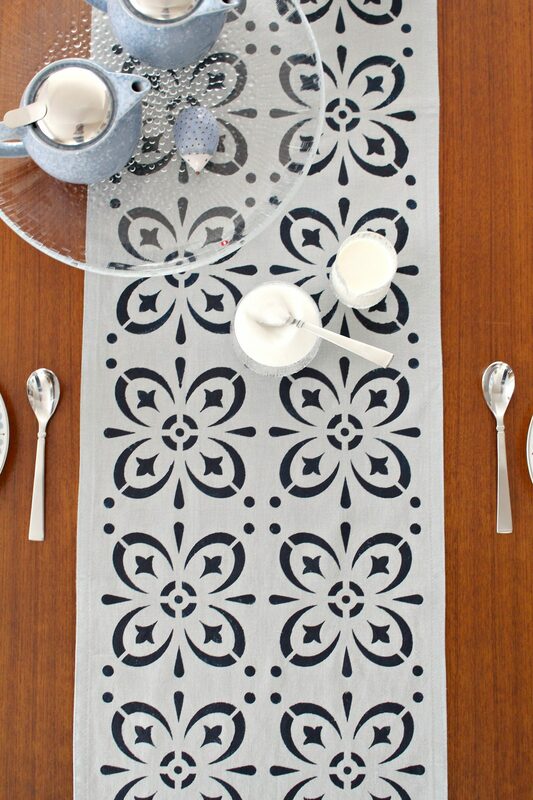 Depending on the brand of textile medium or fabric paint you used, follow the manufacturer’s instructions for setting, ironing and laundering your new DIY stenciled linens. Regular acrylic paint will eventually peel with use and washing, but the textile medium softens the feel of the paint and will help it last. 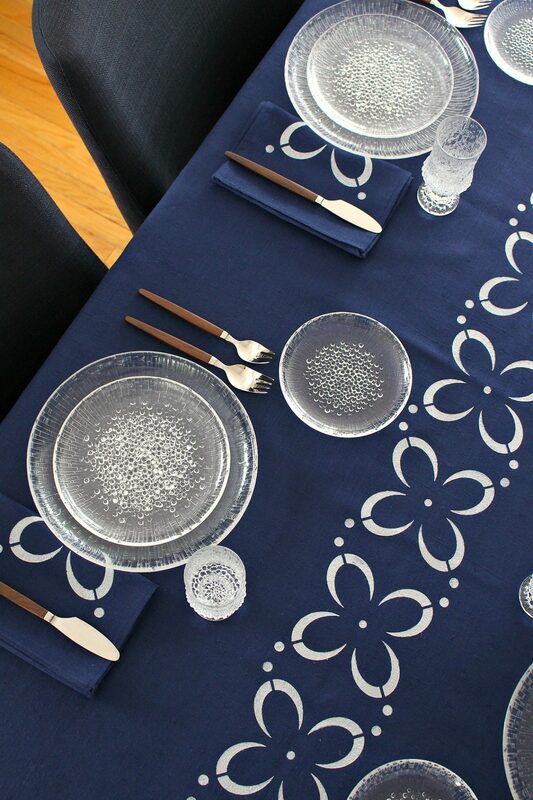 Now let’s take a better look at these gorgeous DIY stenciled linens! Styling these linens was so much fun – I’ve been dreading the end of summer, but this reminded me that with cooler months comes cozy dinners inside, using the good china (for summer patio meals it’s strictly enamel plates these days). 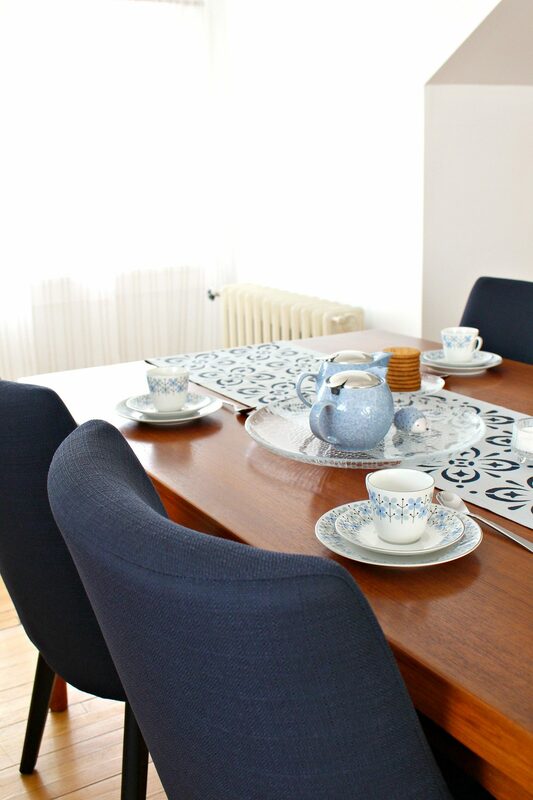 And check out that Iittala Ultima Thule platter – a recent thrift store score. 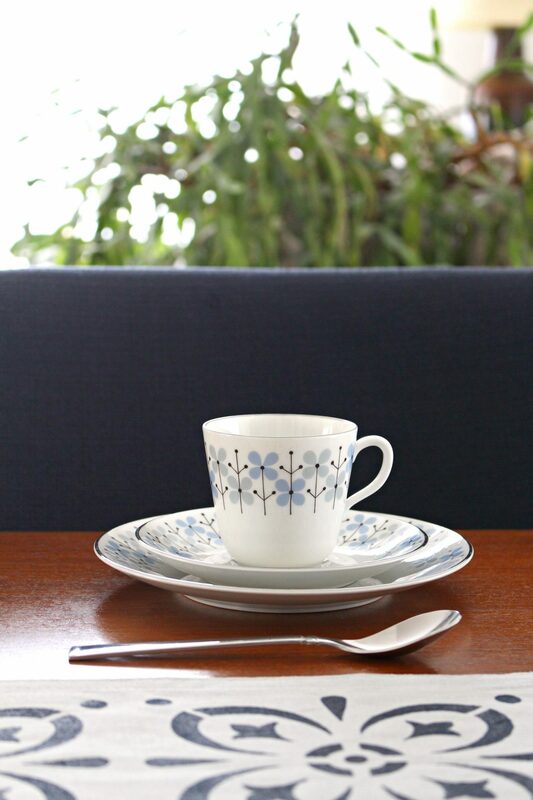 I love how it pairs with the 1960s Rorstrand china I thrifted years ago (they have a new design, in Indigo blues, which is just as pretty). This post was sponsored by Stencil Revolution but all thoughts and opinions are my own. If you’re looking for more inspiration and stencil ideas, check them out on Instagram, Facebook, Twitter, or Pinterest. Thanks for supporting the brands that help me create fun DIY content Dans le Lakehouse. 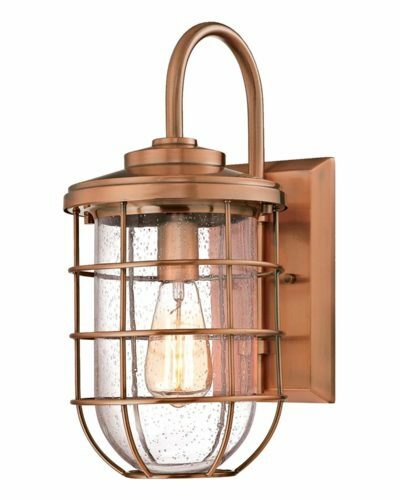 Really beautiful job! I love DIY for certain decor items, but honestly never thought of linens. 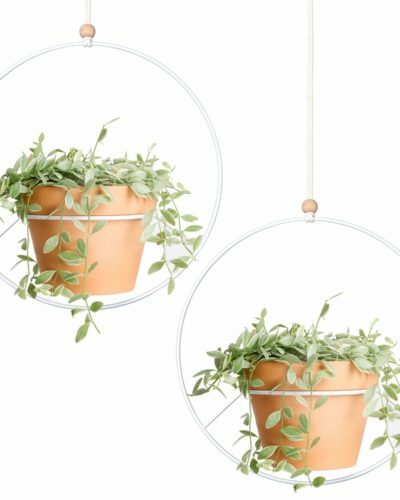 These don’t look like a DIY product, these look like something that I’d buy in a boutique style shop!! Thanks so much! That’s such a nice compliment. 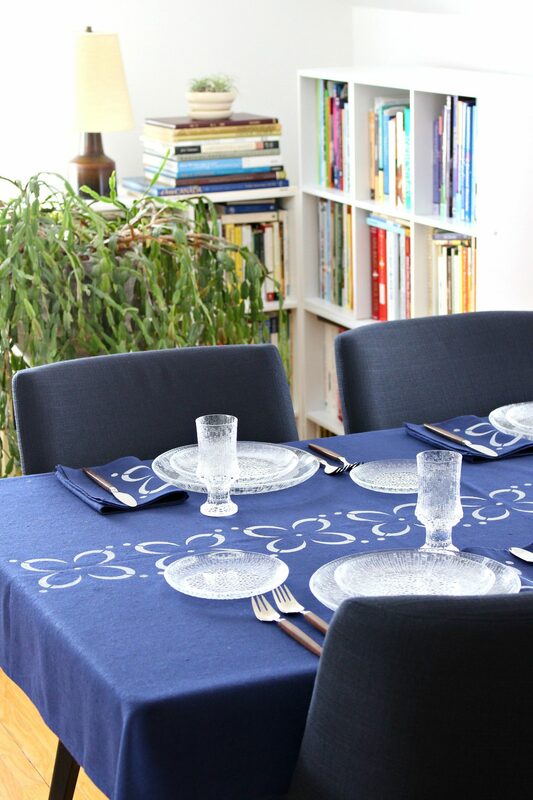 I’m so happy you like these DIY’d linens. 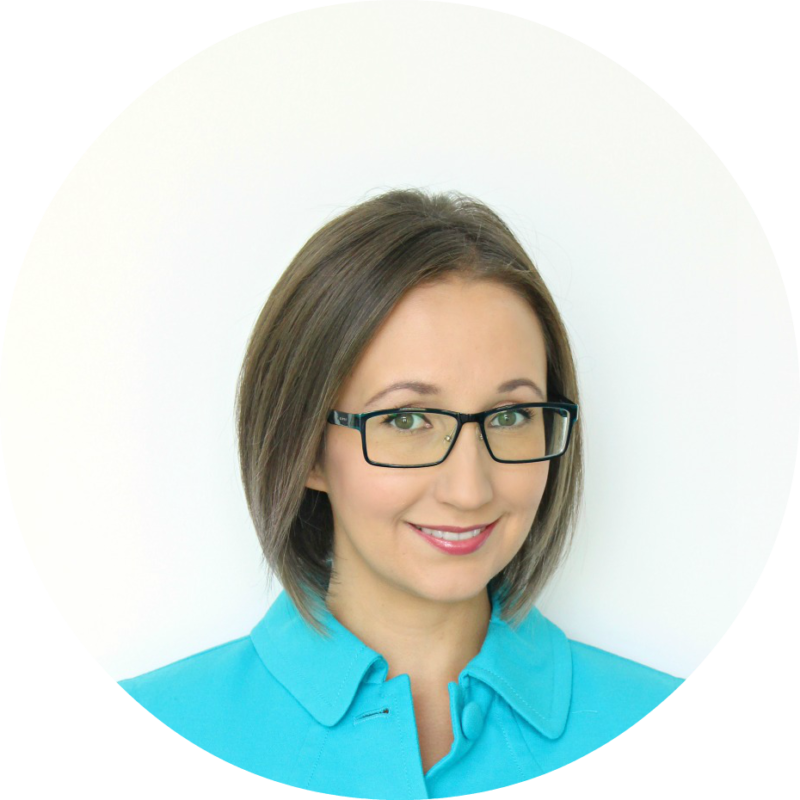 Hi, Tanya! I’m just getting back to you on this, and hope maybe you can give some help. 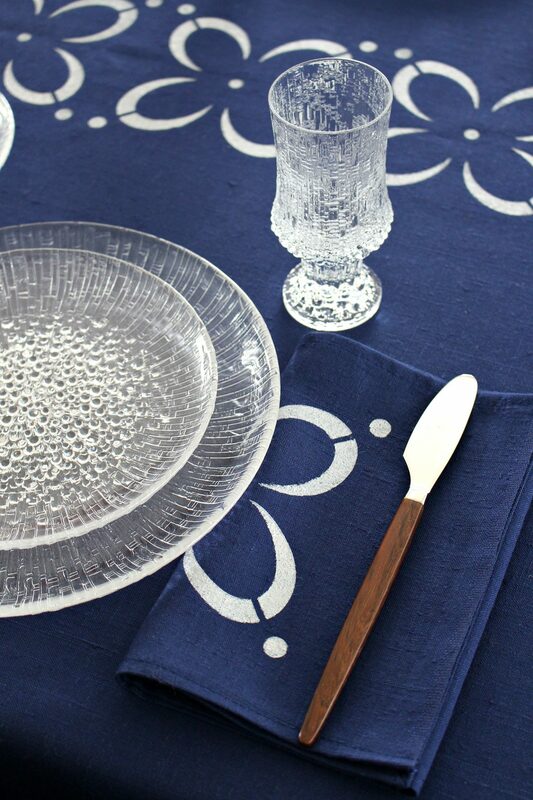 I loved your oval tablecloth from way back when, but couldn’t figure out how to cut the curve for an oval. Did I miss something in the tutorial? 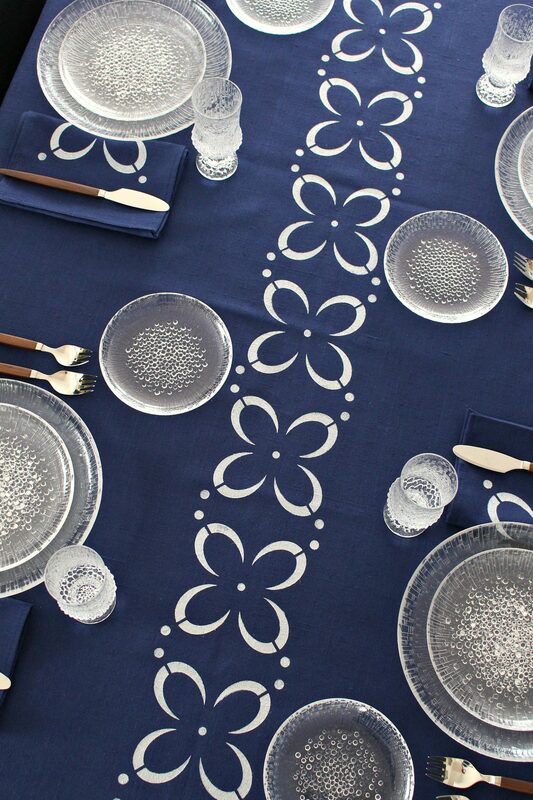 We are settling into my mom’s little cottage (she passed in mid-July, it feels like yesterday), and I’d love to use some of these stenciling techniques to set off her MCM table. Thanks!